All the new races and traits and feats and racial magic items really helped me flesh out my campaign world. The addition of being able to make your own race made me sing soprano. Excellent, excellent book for those who want to play a race that's completely outta the ordinary. Part of the reason I got this book is because in the core rulebook it says something like this: "only for more experienced GMs, having players play odd races can be rewarding and fun, but you have to be careful" etc. but doesn't give you a glimpse of the races or explain how they might effect a campaign world a certain way. Using this book, you can experience what it would be like to play a rare (and really cool) race. Being an Oread is awesome and probably one of the most exciting and fun experiences in my gaming career. The book is focused heavily around the PFRPG "host" campaign, with no clear instructions on how to extrapolate for other campaigns (we use the 3.0 Forgotten Realms setting). So in the end, most of this book is filler and not really very useful. Even the second printing tied the book more closely with the "home team" setting. What little can be gleaned from the book is helpful, but it's not worth the hardcover price if your campaign is something other than the generic one sponsored by Pathfinder. I wonder why it is, that almost every "host" campaign seems like a patchwork quilt of several others, with most of the interesting stuff left out? The Race Guide is how the Advanced Class Guide should have been set up- with clear rules and customization options to create your own class. Great book for players and GM's ready to venture out into some custom races. I don't quite know what it is but this is one of my favorite Paizo products to date. Maybe it's the way the book is organized with each race with its own section. Maybe it's the swappable racial traits akin to class archetypes. Maybe it's the artwork, showing two to three examples of each race to demonstrate the variety within each species. Maybe it's the archetypes, favored class bonus options, notes on society and appearance, spells, feats. It just felt like icing on the cake to include a race builder at the end. so you're supposed to start off easy, right? go by the book, go by the campaign setting they give you. just stick to the six core races, and don't go overboard trying to invent stuff, right? well, I didn't exactly do that. I created a whole world from scratch, messed with the core qualities of numerous races, core races or otherwise, and on top of that, invented a pantheon and mythos which is completely incompatible with Golarion's. this is the first game I will ever GM. to be frank, I'm in trouble. with that context, this book is a godsend, and I'm glad to have the freedom and ease of use this guide gives me. having a game world populated with multiple monstrous races (most of them completely reimagined), I needed to have a way to make sure the stats reflected the people. it breaks immersion to have a race with traits that quite clearly do not make sense for them. something that always bothered me with the core material is how race was treated: I found it restricted, stereotypical. clearly, the Pathfinder race system needs a little diversity, especially if your campaign isn't actually set in Golarion. in another spur of greatness, I can already tell that my players, by now fairly intoxicated on the freedom I've given them, are going to love these new options. I can already see one of them deciding they want to go with one of the very comprehensive and imaginative archetypes, or choosing catfolk or kitsune instead of elf or goblin. the best part is, this book is so easy to figure out, so I am perfectly able to give them this freedom without puzzling over the rules for a month (like I embarrassingly did with the core rulebook). trust me. if you're the kind of Game Master that doesn't like playing by the rules, and likes to do your own thing lore wise (like create a complete departure from the default setting), then this book is almost a necessity for you. for anyone else who likes the idea of monstrous PCs, you'll love this one. I asked for this!! WOO hoo! I hope there is more races then the 7 core!!! Woo hoo. You should read the description. Every playable race in the entire game will be in this book. Plus new ones you can make from scratch. I refuse to buy this book at this point in time. ...but I like that cover! This seems very interesting. Dhampir options alone are enough to peek my curiosity, but options for everybody is great! I realize that this is really preemptive, but is there a chance that we'll see favored class options for non-core races within this book? Very cool but I don't want to wait that long. ...Plus new ones you can make from scratch. That sounds very interesting. Nice touch. So put down your Ideas, but please read it in it's entirety and discuss the various ideas. I do believe that this could be fun. Much better name than "Ultimate races". Vic. There is no way you're going to be able to get race in the name of this thing without setting somebody off. If these are the advanced races does that make all the others inferior and suitable for genocide/enslavement? How about calling this thing the advanced species guide instead? They're called races in the game, so the word "race" is going to be in the title of the book. In fact, the title of the book is going to be "Advanced Race Guide". 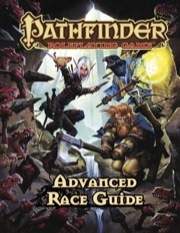 Given that EVERY SINGLE PC-appropriate race will be included in this book, they all get to be "advanced" races together. Does that mean that a black dragon or an aboleth or something might get offended because it is not "advanced"? So be it. I am not afraid of them, because they are imaginary. More important, I think, is the clever use of the singular "Race" in the title of a guide to multiple races. You'd have to work pretty hard to ignore the obvious conclusion that it's an advanced guide to the game element called "race", not to a guide to an advanced race (since it contains multiple) or to advanced races (since the title is singular). So, the rest of us can all safely ignore anyone who makes such a strenuous effort to be offended. I demand all of these! Please? Please please please? So ... sure, no problem. I know that they are basically just human with an aquatic template, but I think the descendants of Azlant deserve a bit more love than the occasional paragraph they have received in other products. Todd, your "Little Dragon" fetish is scary. I don't prefer any races beside humans, hope their part of the book will be the largest. Only one thing. Mordan Spire Elf extended!!!!!!!!!!!!!! So this has 64 pages less the the just announced Beastary 3. But both retail for $39.99. Who said it was 64 pages? Since it is a hardback book I imagine it will be at least 200 pages. The Beastary 3 is 320 pages, the Advanced Race Guide 256 pages. 64 pages LESS then the Beastary 3. But both retail for the same price. All Paizo hardcovers cost 40 USD. While APG/UM/UC/ARG have fever pages, they have more text, due to bestiaries being art heavy. So it kinda evens out. I also say yes to catgirls with no cha penalty to there stats. My GM is going to 'love' this book. He always likes to play races besides the core 7. I know he will especially like the section on making your own custom race. Looking forward to this book as well, but just wish the date wasn't so far out! Not interested. Also, would be a sad panda if supporting cast NPCs of exotic races would become suddenly more frequent than the current rare/thematically appropriate (eg. tieflings in CoT) as a consequence. I don't know about that, adventurers are the oddball of the game world. I asked something similar when Ultimate Magic came out (at 256 pages for $39.99). I'd guess that as we get further from core, sales are fewer, so prices need to be higher to maintain margins. I would further guess that Bestiaries are always more popular and have greater sales. As always, though, the question will come down to what it's worth to you personally. Is a 256-full color book on races worth $39.99 to you (or $25-27 on amazon) or not? For me, being a subscriber (thus the free pdf) and owning an iPad2, it very much *is* worth the price. Besides, it's Paizo, so you know the quality will be there. Any plans for a Golarion specific follow-up? And please read the entries. Did you know that the German version doesn't use "Rasse" (=race). It uses "Volk" (=people). I don't know how long that is, it was that way in 3e. We're never using Volk, but that's the way it is. Maybe it is because of the racism angle, but then again, the German translations have a long tradition of being bad and using exactly the wrong words. wish they hadn't announced so far in advance! can't wait!! I just gotta say I appreciate the response on the title change. I was gonna buy this book anyway, but now I can buy it and like the title! The only Up side to early announcement is that we can compile a wishlist for the book for the staff to know what we need, want and any useful ideas that we come up with. I wonder . . . will some of the playable (non-core) races detailed in this book be augmented for general PC 'balance', as tieflings were in CoT? I already put that on the wish list in the first post.